Are You a Social Liberal or a Social Democrat? In the modern Western world, two political movements dominate mainstream centrist and center-left politics: social liberalism and social democracy. They are similar movements, advocating social progress and economic reform. Due to their many similarities, it can often be difficult to distinguish one from the other. That is the purpose of this quiz. Hopefully, you will soon know which one your views most closely match. Which of these would you consider yourself? 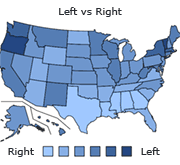 Which of these political parties do you think has better policies? Which of these candidates did you support (or would you support) in the 2016 U.S. Democratic primaries? If you aren't familiar with U.S. politics or didn't follow the primaries, skip this question. Which of these is a greater impediment to progress? The 2016 U.S. Democratic primaries were rigged against Bernie Sanders. We should be focused on social progress moreso than economic reform. Economically, we should be focused on the here and now, not trying to achieve some far-away ideal. What is social progress about? Quiz topic: Am I a Social Liberal or a Social Democrat?